The Mentoring and Engaging thru Academic Success (METAS) peer mentoring program is currently seeking peer mentors for the 2017-18 academic year. 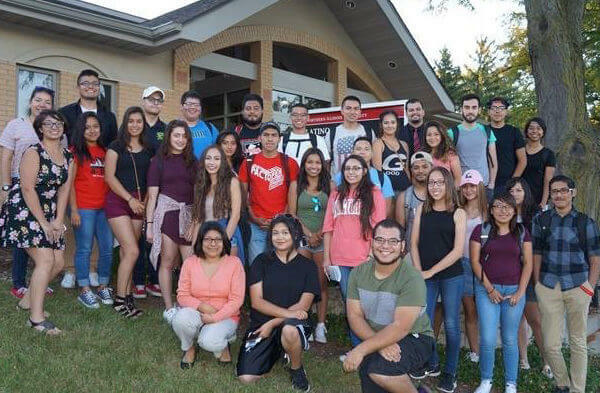 The program is designed to provide a welcoming environment and a “home away from home” atmosphere for Latina/o college freshmen by providing social, cultural and academic support. The mentors will assist Latino mentees with their transition and adjustment to college life. In addition, the program is focused on creating a sense of belonging and community, as well as encouraging the academic success and social well-being among Latina/o college freshmen. The program helps Latino freshmen learn about campus and classes, said Nicole Peña, Rosales’ mentee. “It was a fun experience because I made friends and received help from my mentor,” she said. To become a peer mentor, a student must have completed at least one year at NIU by summer 2017, be in good academic and disciplinary standing (minimum cumulative GPA of 2.5), and have an awareness and appreciation of all forms of diversity. The peer mentor is expected to provide information on NIU services and resources, encourage involvement in student activities and provide academic support. The positions are volunteer-based (unpaid). To apply for a peer mentor position, please fill out the online application at: go.niu.edu/mentor. Priority deadline is Monday, March 6. For more information, contact Angélica Mendoza, Assistant Director, Latino Resource Center, at 815-753-8645 or amendoza7@niu.edu.